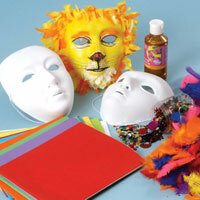 Led by teaching artist Brad Shaw, students will create their own unique mask using paper mache and paints. Brad will work with the students to create characters with their masks and put them together in a mini-play! Or even better! You could do a Theatre residency with Brad and put on a real production where kids would learn to write their own play and then put on a show! To schedule this workshop please call us at 816-531-4022 or email us at booknow@kcya.org. Fees: $110 single, $95 each for 2 or more on the same day; Materials Fee: to be determined; A residency requires a $110 planning meeting / The break between workshops must not exceed 90 minutes to receive the reduced rate. Title 1 Schools may qualify for funding assistance. Requirements: Worktables; newspapers; teachers must be present at all times during workshop.